A Whale of a Crime is underway and all clues point to Vancouver, Canada. Never fear: mystery buffs Colleen Glynn and Linda McNab are on the case. 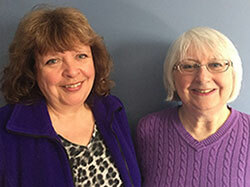 Colleen is a retired administrative assistant and Linda is a retired social worker who leads a mystery book club. Colleen and Linda are both avid fans of mystery novels and have been attending Left Coast Crime conventions since Calamari Crime in Monterey (2014). They are excited to be co-chairs for Whale of a Crime. Email Stan Ulrich with questions about registration. Linda L. Richards is an author and journalist. Her published books include three series of novels featuring strong female protagonists. She is president of the Western Canadian Chapter of Sisters in Crime, the former publisher of Self-Counsel Press and the founder and publisher of January Magazine. Her short story, “Terminal City” appears in Vancouver Noir (Akashic Books). Linda divides her time between Vancouver, Canada; Phoenix, Arizona; and Paso Robles, California. Pam Fairweather Thomson is a retired teacher who has always loved reading mysteries. She has attended Malice Domestic, Mayhem in the Midlands, three Bouchercons, and seven Left Coast Crime conventions: 2002, Portland, OR; 2004, Monterey, CA; 2009, Waikoloa, HI; 2010, Los Angeles, CA; 2014, Monterey, CA; 2016, Phoenix, AZ; 2018, Reno, NV. She is looking forward to helping welcome everyone to the debut of Left Coast Crime in Canada. Beautiful British Columbia has been Pam’s home since she was three years old. After growing up in Powell River on the Upper Sunshine Coast and working in Greater Vancouver, she then retired to live on the Lower Sunshine Coast (only one short ferry ride from Vancouver!). The official Ghost of Honour this year is L.R. Wright, whose books were set in the Lower Sunshine Coast. We are happy to accept crime fiction and non-fiction for distribution in the book bags. There is no charge, but you will need to ship the books to the event in late February or early March. Any quantity is accepted. We prefer not to have more than 200 copies of a single title; multiple titles are recommended if you would like to place a book in every bag. In order to make book distribution work for both the participants (who will love receiving your books) and the booksellers (who will plan to bring different books to sell) we ask that you provide our Publisher Liason with the title(s) and number of current releases you would like to donate. If interested in donating books, please contact Lucinda. Bill & Toby were on the initial LCC Committee in San Francisco and have participated ever since. Toby retired from her position at Calypte Biomedical in 2009 and Bill is a pediatrician who currently works with the State Medical society as a surveyor of Quality Medical Practices. Both were formally introduced to the mystery convention in 1985 at Bouchercon in San Francisco and have attended almost all Bouchercons since. They received the Don Sandstrom Memorial Award for Lifetime Achievement in Mystery Fandom in 2008 and the David Thompson Memorial Special Service Award at Bouchercon Raleigh in 2015. Bill and Toby were the program chairs for Bouchercon 1997 in Monterey; and were chairs of the Left Coast Crime conventions in 2004 (Monterey) and 2009 (Hawaii) and co-chairs (with Lucinda Surber & Stan Ulrich) in 2014 (Monterey). They have attended all of the LCC conventions. Bill and Toby were Fan Guests of Honor at the first CrimeFest in Bristol, England, and have been participants in Janet Rudolph’s Mystery Readers International reading group since 1985. They also have “chaired” their own summer reading group, Mystery Addicts, for about 20 years. Bill and Toby presently own about 16,000 mysteries, some of which they have even read.